Engineers at the University of California San Diego have developed a smart glove that wirelessly translates the American Sign Language alphabet into text and controls a virtual hand to mimic sign language gestures. The device, which engineers call “The Language of Glove,” was built for less than $100 using stretchable and printable electronics that are inexpensive, commercially available and easy to assemble. The glove was created in the lab of nanoengineering professor Darren Lipomi. The lead graduate student on the project, Timothy O'Connor, spoke to 10 News - ABC San Diego about the work. Check out the video clip above. In addition to decoding American Sign Language gestures, researchers are developing the glove to be used in a variety of other applications ranging from virtual and augmented reality to telesurgery, technical training and defense. The glove also made an appearance in KPBS, Newsweek, Popular Mechanics, IEEE Spectrum and various other news outlets. Click here for the full story on the glove -- read more on how it was built, how it works and what's next. When you have a medical scan, it’s usually an MRI (magnetic resonance imaging), CT (computed tomography) or more recently, PL imaging (photoluminescence). Sometimes it’s all three as your care team works to determine what’s ailing you. That means three different appointments and three different imaging agents — typically nasty-tasting stuff you have to drink in order to sufficiently enhance the imaging signal so that diseased tissue can be distinguished from healthy tissue. Each comes with its own side effects and potential risks. “What the medical field has long needed is a single imaging agent that will work across multiple imaging systems,” said Adah Almutairi, PhD, associate professor in the Skaggs School of Pharmacy and Pharmaceutical Sciences at UC San Diego. Almutairi is always one to take up a challenge like that. Her bioresponsive materials lab is known for designing and developing smart polymers, nanoparticles and hydrogels for many innovative medical and research applications. One of Almutairi’s pet interests is in lanthanides, a family of naturally occurring chemicals that intrigued 19th century chemists because, among many other interesting properties, they burn easily in air, fluoresce under UV light and react with most nonmetals. Inexplicably, scientific interest in lanthanides waned in the 1970s. A couple of years ago, Almutairi took up the mantle to explore how lanthanides do one special thing: convert low energy light into high energy light. She has long believed that her team could take advantage of that property for medical applications. Almutairi and her team recently developed a new nanoparticle with a lanthanide-based core-shell-shell architecture. 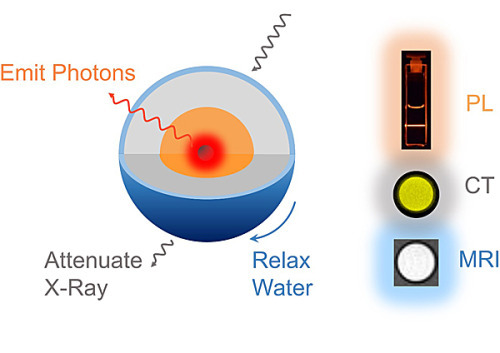 The nanoparticle emits light for optical imaging, but also relaxes water molecules for MRI and attenuates X-rays for CT simultaneously. Three in one: the lanthanide nanoparticles can be used for photoluminescence (PL), computed tomography (CT) and magnetic resonance imaging (MRI) simultaneously. In a study published in Nano Letters, the researchers tested these nanoparticles in “phantom” tissue — a hydrogel system that mimics living tissue in the laboratory. Not only does the nanoparticle work for each imaging type, it works better than each individual imaging agent on its own. The team is now working to reduce the size of their new imaging nanoparticle so a patient’s kidneys can clear it more easily from the bloodstream. UC San Diego Jacobs School of Engineering mechanical engineering alumnus Aaron Burmeister (B.S. mechanical engineering 2001) has been selected as one of the nation’s top scientists and engineers of the year by the Assistant Secretary of the Navy for Research Development and Acquisition. Burmeister is an engineer for Space and Naval Warfare Systems Center Pacific (SSC Pacific). He won the prestigious Dr. Delores M. Etter Top Scientists and Engineers award, in the individual engineer category, for his work developing an autonomous amphibious vehicle. “It’s challenging because perception, navigation, and control strategies have to change as the vehicle transitions from sea to surf zone to land domains. We have started the effort by developing an autonomy system that can control a commercially available amphibious manned vehicle capable of going up to 45 mph on land or water,” explained Burmeister, in a statement. He goes into more detail on the project in a US Navy video by Aaron Lebsack (embedded below). On June 14, the Center on Global Transformation (CGT) in partnership with the Institute for the Global Entrepreneur (IGE) hosted the UC San Diego Application Student Innovation Contest for undergraduate students at the Jacobs School of Engineering. Contest submissions were judged by industry experts, including Qualcomm executives and serial tech entrepreneurs. The winning product, by Audrey Olson, was called MatchRest. It is a mutual accountability software application that matches people with comparable habits and sleep goals and rewarded them for staying and keeping one another on track. For example, a person with the sleep goals of falling asleep before midnight and turning off her computer an hour beforehand would check in with her partner nightly before doing each, and vice versa. Each user would also have a virtual bedroom showcasing the status of his or her virtual avatar, which could be upgraded or customized more thoroughly as more goals were reached. Audrey won $5,000 in prize money. Second and third place students received $2,000 and $1,000 respectively. Audrey’s partner in developing the product is Jesse Ren, acomputer science student and a 2016 NSF I-Corps participant. The Institute of Global Entrepreneur’s I-Corps program teaches lean start-up principles that are focused on product/market fit and customer discovery. Next up for the team, they plan on doing initial customer interviews in the fall to help in the development of their minimum viable product (MVP). They are currently working on personal projects (one such project is for UC San Diego's Project-in-a-Box initiative) while studying, applying, and interviewing for full-time post-graduate positions in the software industry. We reached out to Elizabeth Lyons, Professor at the School of Global Policy, to talk about the contest. IGE - What is the innovation contest and why hold it now? EL - The UC San Diego Student Innovation Contest is a contest for undergraduates at the Jacobs School of Engineering (JSoE), who are interested in working on a real-world problem that has not yet been solved; second, expanding their knowledge and capabilities through a hands-on project; and third, the opportunity to win some money. We held the contest for the first time this year because of the important role innovation plays in economic growth and our interest in understanding whether it’s possible to encourage more innovation through contests like this. We also wanted to give JSoE students the opportunity to grow as innovators, and to build more links between the School of Global Policy and Strategy, JSoE, and the Institute for the Global Entrepreneur (IGE). IGE - What was it that made the winning team stand out? EL - The winner of the contest did an outstanding job of building a commercially viable and technologically functional product. All the judges agreed that her application was user-friendly and that her revenue model was compelling. She stood out in how well she took into consideration all aspects of the innovative process. We received a number of submissions that were technologically very compelling or that had the potential to be commercially successful, but only a few that scored well in both areas. IGE - When is the next challenge and how do teams sign up? EL - We are currently working on how to proceed with the contest going forward. Our options for the next challenge will depend on the lessons we’re now compiling from the first contest. We’ve received very helpful feedback from many of our contest participants, and we’re also trying to analyze what led some participants to exert more effort than others in the hopes that we can improve on our contest design going forward. We will be sure to announce any upcoming challenges as soon as we’ve finalized the details!